Oh well, what harm can be done for less than eight bucks.... please keep us posted on how this turnes out. That's what I figure. Considering all the shortcuts that have been done to this poor car to keep it together (the pollution control system broke off and instead of giving BMW $900 for a 2" pipe, we welded a piece of metal over the hole) I can't see any harm in cobbling on some other flasher. I thought it was worth asking if it seemed like a reasonable guess but I'm just going to order one. I also found this - http://www.ceclighting.com/pdfs/EF26.pdf which I can get in the U.S. and I may get one of those since it might work better. Try the amazon flasher, if the unit doesn't work, its only 9 dollars in the bin. I see that now, thanks. Yes, and the 3-pin option is fine too. I'm okay splicing diodes in to get the indicator back. If the $9 option won't cut it, I' have all sorts of Arduinos laying about and I can go high tech. I went the 3-pin route. The Novita EP34 was in stock at the local store for $12. I made some male/female pigtails to rearrange the pins to fit the factory connector and it works great. I don't have the dash indicator at the moment. Rather than using the diode solution that requires modifying a harness or splicing into wires, I'm going to get that back by adding a MOSFET to the flasher, using the output to gate it and let it handle switching the current to the dash indicator. I don't have time now but I'll do it in a week or so and post the mods. 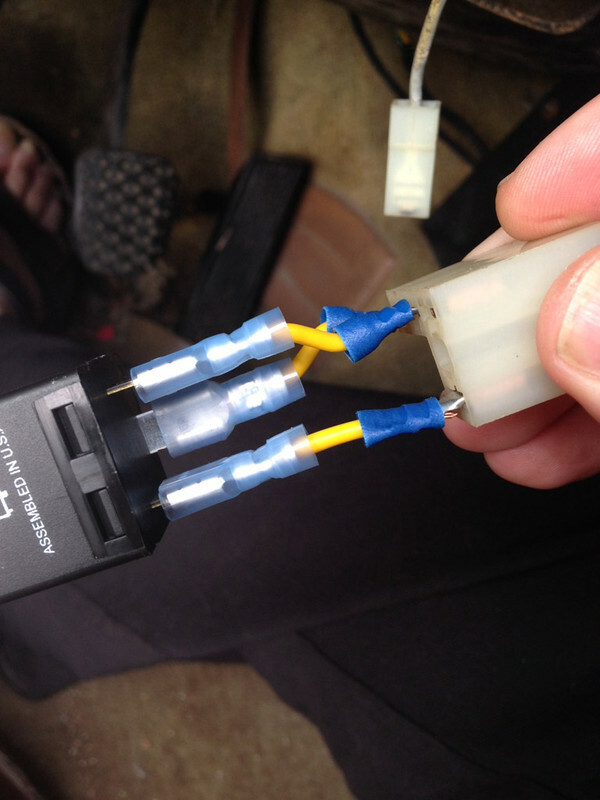 This way the car is unmodified and I simply hacked up the flasher to give me the extra output. Side question - the stray pigtail above is a gray wire that seems to have hot battery voltage. What is it for? It's not connected (obviously) and it seems to have no place to connect it. It's not corroded which *might* mean it got disconnected or maybe not. Was there some optional feature my car doesn't have?